It is always the individual teacher who can best assess, when and how it is meaningful to incorporate ICT in education. Hence, we see it as our task to support teachers' ict pedagogical reflections and choices. We are doing this by presenting an ePedagogical Framework as a help in structuring the teacher's ict-pedagogical reflections, and by inspiring to new ways of teaching, by describing some of the options in a series of free, digital learning tools. Our goal is both to inspire teachers to teach in new ways, and to support the teacher in making the pedagogical choices, that should form the ground for the choice- and use of digital technologies in teaching. An appropriate use of ICT in education must always be based on the actual teaching situation. Therefore, we do not focus on the sharing of readymade, learning ressources with built-in pedagogical aims and strategies. Instead we aim to support each teacher and team to select and apply free, digital learning tools in the best ways in their teaching. In support of the teacher's pedagogical reflections on the use of ICT in education, we have developed The ePedagogical Framework. The ePedagogical Framework is an ICT-focused tool, that can serve as the basis for the teacher's ICT pedagogical reflections and qualify the choice and use of digital learning resources. 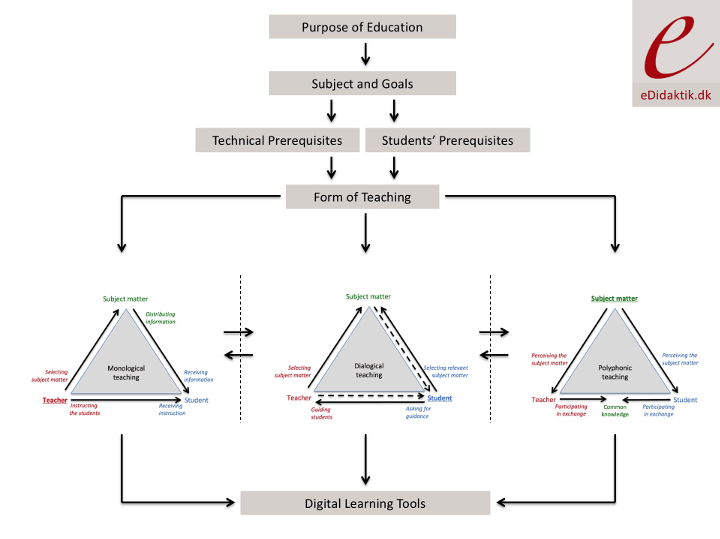 The model is based on the distinction between three forms of teaching, and each of these teaching forms can be supported by various types of digital learning tools. eDidaktik presents a series of articles on free digital learning tools. The articles describe the functionality of the learning tools, and give examples on how the learning resources can support the different forms of teaching that are presented in the ePedagogical Framework. The articles can serve as inspiration for teachers, who seek to incorporate ICT in education. The described resources are all free and web-based, and thus works across all digital platforms. On eDidaktik.dk you will also find information about our inspirational talks and workshops on ICT in education, ICT pedagogy, digital learning tools, digital literacies and related topics, and you can seek our advice and services relating to research projects- and projects related to the development of digital learning resources. If you have any questions or comments on the content of our website, please feel free to contact us.